So, I will admit, I’m obsessed with swirling lately. It’s just so pretty. It dresses anything up! I know there are people out there that won’t eat oatmeal just because of the way it looks. Well, all it needs is a little fanciness! To make the swirl in this oatmeal I just let it cool a bit and used the end of a chopstick to make the swirl indentation. Then I used my secret weapon in the kitchen, a clean medicine syringe. I filled one with the blueberry syrup and one with the cream and just piped it into the indentation. Simple as that! 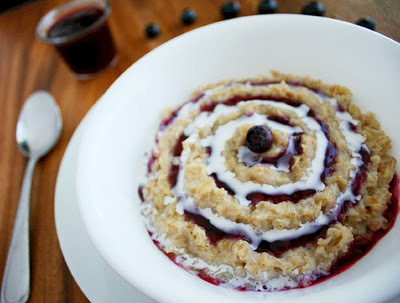 Let me just say this oatmeal recipe can get anyone to eat oatmeal! It is without a doubt the BEST oatmeal I’ve ever had! Those oatmeal packets with artificial flavors and pieces of who knows what are just that, too artificial. 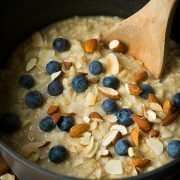 This oatmeal is full of fresh, natural and pure blueberry flavor. 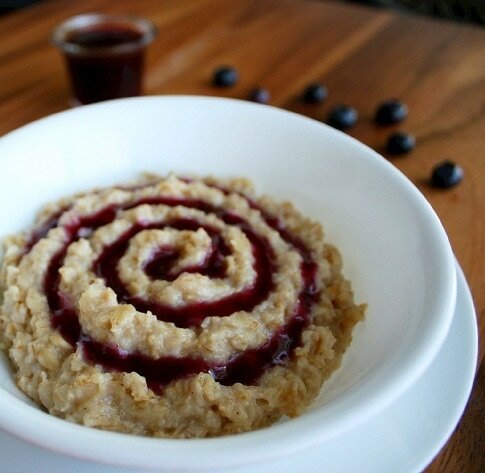 After you finish a bowl of this warm creamy blueberry oatmeal you’re going to want another! 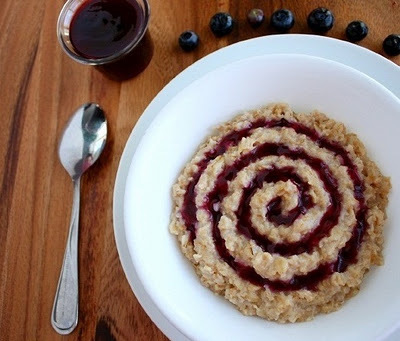 PS this oatmeal is also wonderful with raspberry syrup in place of blueberry. I love them both the same! The recipe for raspberry syrup can be found here. 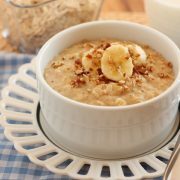 Soon to be your new favorite way to make oatmeal! Bring water or milk to a boil in a medium saucepan. Stir in salt and oats. Cook over medium heat for 5 minutes, stirring occasionally. Remove from heat, stir in butter, brown sugar and cinnamon. Spoon mixture into 4 serving bowls. Top each serving with 3 Tbsp blueberry syrup and 2 Tbsp whipping cream. Serve with optional blueberries. In a medium saucepan whisk together sugar and cornstarch until well blended. Stir in water and lemon juice. Add blueberries. Bring mixture to a boil over medium high heat, stirring constantly. Boil 1 minute. Force mixture through a fine mesh sieve into a bowl. Store syrup in an airtight container in the refrigerator up to 1 week. This blueberry syrup is my favorite syrup on pancakes (along with fresh raspberry syrup, I like to do half and half because I can’t choose a favorite =). 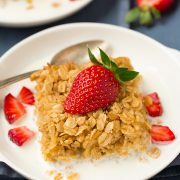 It can also be used for many other things like this best ever oatmeal or as an ice cream topping. So, I’d recommend if you are making the syrup for oatmeal just make the full batch, you won’t regret it! It’s so good you might even want to drink it =).